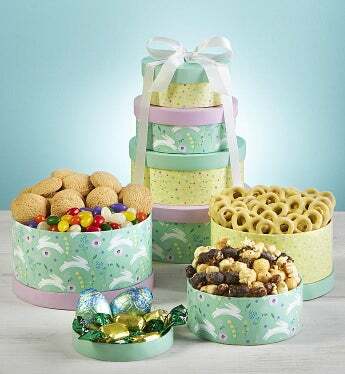 This brightly decorated tower is filled with a delicious selection of chocolate & sweets for Easter! Imagine their smiles as they open each egg-shaped box to see what goodies are inside, like decadent Harry & David® Milk Chocolate Mini Mints, Lemon Cream Pretzels, Harry & David® Moose Munch® Dark Chocolate Popcorn Mix and more! It's an "egg-cellent" way to wish your special honey-bunnies a very Happy Easter!